If there’s one thing I love about entertainment writing, it’s the opportunity to make new discoveries. 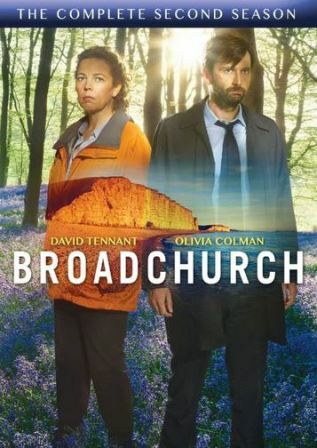 In this case the new discovery is the British television series Broadchurch starring David Tennant and Olivia Colman. As a huge fan of Tennant’s portrayal of the tenth doctor on Doctor Who I was very excited to see him on a new show. In preparation for the newly released season two DVD, I quickly made my way through season one on Netflix. I loved the show. I’ve always had a liking for a good police procedural, and this one did offer up a good mystery, and but it also has well developed characters. I can hardly recommend Broadchurch more, especially for anyone who enjoys good character drama intertwined with a head-scratching mystery. Yes, Broadchurch can get a little overwrought at times, but I found it to be a thoroughly enjoyable entertainment. 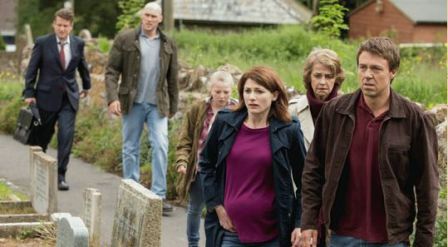 The second season of Broadchurch directly follows the events of season one with the trial of Joe Miller (Matthew Gravelle), the suspected killer of young Danny Latimer. 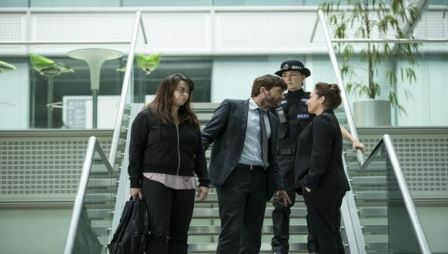 I had wondered after finishing the first season if the show would come up with an entirely new case for detectives Ellie Miller (Colman) and Alec Hardy (Tennant) to solve. At first I was a little disappointed they didn’t. Since they were pretty definitive about who the killer was in the first season the trial offered very little mystery. Furthermore, the trial itself veered into such ineptitude from all parties that it started to seem unrealistic. Compounding a somewhat shaky start, they introduced a new mystery that didn’t gel all that well with the Danny Latimer story at first. It turns out Hardy had been harboring a key witness to his previous case, Claire Ripley (Eve Myles), during the entire Danny Latimer investigation. Needless to say things got a little confusing as the show jumped back and forth between the two separate cases. Their only tie was Hardy himself, who had been said to be incompetent in his handling of the previous case involving the murder of two girls. However, as the stories unfolded the show returned to everything that made season one so good. What works so well are the characters. Everyone has secrets. Some are reprehensible and some are just secrets, but when they’re blended all together things get explosive. Broadchurch is about perception, how we perceive ourselves and everyone around us. It’s scary to see how easily people can be led to believe something based on very little evidence. What is most effective about Broadchurch is the emotional punch it packs. 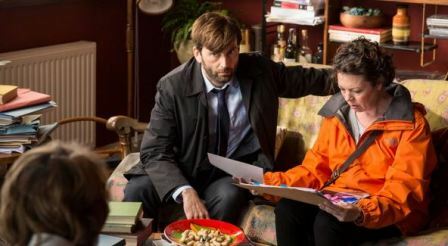 David Tennant and Olivia Colman are excellent in their respective roles. Tennant couldn’t be further from The Doctor in his portrayal of the somewhat misanthropic Hardy and that is a good thing (also check out his performance in the remake of Fright Night for something really different). I loved seeing such a gritty side of him. In season two I also enjoyed the performances from Charlotte Rampling and Marianne Jean-Baptiste as the attorneys trying the case. Jean-Baptiste did a good job of making her character realistically unlikeable. She wasn’t over-the-top, she was just someone you probably didn’t want to be on the wrong side of. The season two DVD contains a few special features including a making of featurette, deleted scenes, cast and crew interviews, and a bunch of behind-the-scenes featurettes. It’s not a huge package but there’s enough there to provide some extra insight into the show. Overall, I definitely recommend giving Broadchurch a try. On a side note, Broadchurch was remade in America as Gracepoint (which was recently cancelled) and also starred David Tennant. I have yet to see it, but anyone who watched that show and wants to see more should definitely seek out this one.